These are the implementations of the RISC operators inherited from the base class, plus some additional functionality specific to this domain. 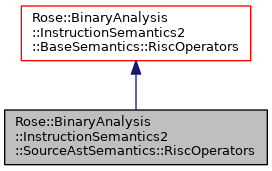 The semantic state is split between the State object normally attached to semantic domains, and the side effect list stored in this RiscOperators object. Neither is complete by itself. Definition at line 219 of file SourceAstSemantics2.h. Side effects in the order they occur. Definition at line 249 of file SourceAstSemantics2.h. Instantiates a new RiscOperators object and configures it to use semantic values and states that are defaults for SourceAstSemantics. Definition at line 271 of file SourceAstSemantics2.h. References Rose::BinaryAnalysis::InstructionSemantics2::SourceAstSemantics::SValue::instance(), Rose::BinaryAnalysis::InstructionSemantics2::BaseSemantics::RegisterStateGeneric::instance(), Rose::BinaryAnalysis::InstructionSemantics2::BaseSemantics::State::instance(), and Rose::BinaryAnalysis::InstructionSemantics2::BaseSemantics::RiscOperators::protoval(). An SMT solver may be specified as the second argument because the base class expects one, but it is not used for this semantic domain. See solver for details. Definition at line 284 of file SourceAstSemantics2.h. Definition at line 290 of file SourceAstSemantics2.h. Definition at line 297 of file SourceAstSemantics2.h. Definition at line 302 of file SourceAstSemantics2.h. Run-time promotion of a base RiscOperators instance to an instance of this semantic domain's operators. This is a checked conversion–it will fail if x does not point to a SourceAstSemantics::RiscOperators object. Definition at line 312 of file SourceAstSemantics2.h. const std::string & ctext = ""
A side effect is either a call to a special source function that doesn't return a value, or an assignment to a register or memory location. In the latter case (assignment) a new temporary variable is created and returned. This temporary can be used instead of the original expression if desired. This substitutes one value for another. These records are stored as side effects: although they don't change the single global state of the C program, they do change a local state. These substitutions generally become the static single assignment (SSA) part of the generated C code. Accumulated side effects and substitutions. Returns the side effects and substitutions in the order they occurred. Definition at line 342 of file SourceAstSemantics2.h. Reset state to initial conditions. Global variable name for a register. No attempt is made to ensure that the register really has a valid global variable. The rule is that if the register exists as a single location in the register state then it has a global variable. Definition at line 356 of file SourceAstSemantics2.h. This causes all subsequent side effects (but not substitutions) to be discarded. For instance, the x86 HLT instruction will call this and the effect is that the translation assumes that no side effects generated after the point that this method is called are ever actually reached. Resetting the state via resetState will also change the execution state from halted to running. Definition at line 368 of file SourceAstSemantics2.h. The resuling mask has a type that is nBits wide, and it has nSet bits set and shifted left sa. The nSet and sa are optimized for cases of 0 and 1 and generate correct C shift operators when they are too large for the result type.